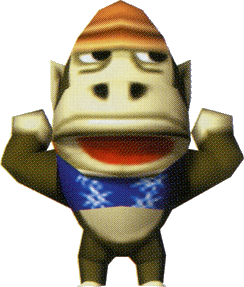 Yodel is a lazy gorilla islander who only appeared in Animal Crossing and Doubutsu no Mori e+. His name and catchphrase, which is "odelay," refer to yodeling, a form of singing. Yodel's catchphrase eventually became Louie's catchphrase in Animal Crossing: Happy Home Designer. Yodel is a grey gorilla who appears to dress as a warm-clothed hiker, which is also where his name "Yodel" originated from: Yodeling is usually what is thought hikers would do up on the mountain peaks. His head, belly, arms and legs are all white and he wears a warm winter hat. He has large, half-closed black eyes that peer to the right, while also having wrinkles underneath the lower eyelids. On his back is a small, tan hiking backpack, similar to the one worn by Wendell. He initially wears the Blue Aloha Shirt. Yodel has a lazy personality, which means he will enjoy eating and sleeping. His laid-back lifestyle allows for the player to get along with him easily, making him easy to befriend. For the most part, Yodel will participate in hobbies simply for relaxation, especially if there is food involved. Yodel gets along well with Normal villagers, as well as Cranky villagers, the latter of which admire his lifestyle. In contrast, however, Jock villagers will conflict with Yodel due to opposite lifestyles, and Snooty villagers will be offended by his comments about appearance. In Animal Crossing, Yodel's house lacks any furniture when first seen. He will request from the player an Azalea Bonsai, an Exotic Bureau, an Exotic Chair, an Exotic Chest, an Exotic End Table, a Pine Bonsai, a Plum Bonsai, and a Retro Stereo. Yodel may enjoy life on a tropical island, but his one true passion in life is mountain climbing. He was so depressed by all the garbage people left in the mountains that he had to leave. Please don't litter! Modified on March 13, 2019, at 17:00.